Thanks to everyone who came along last Saturday night to our annual whist drive. We had an amazing turn out with 60 people playing cards, blethering, catching up, laughing, having a fabulous tea with delicious home baking, playing some demon cards and enjoying a great raffle. Thank you to Christine, Susan and Agnes who organised and ran it on the night and to all who helped by bringing cakes and raffle prizes. And the winners and "loosers" were..
Drymen Show is one of five in the local area along with Gargunnock, Stirling, Braco and Doune and Dunblane. Every year before the show season starts we gather for our annual 10 pin bowling competition for some friendly competition and to start discussions on how we can work as collaboratively as possible to make all our shows as successful as possible. 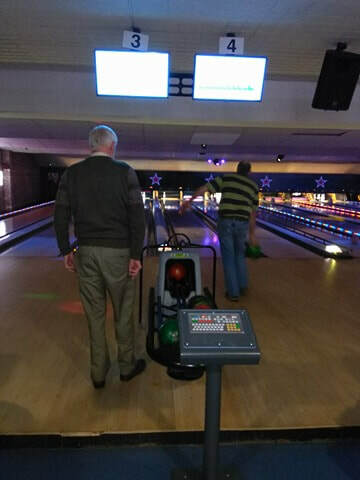 This year's competition was on Friday 15th February at Stirling AMF Bowling and it was a ​great wee night with 60 people who volunteer and run our 5 local agricultural shows getting together for some friendly rivalry on the bowling alleys. Thank you to everyone who came along. Good fun, great to catch and a great way to kick start this year's show planning. Please see below for the headline results and some photos but full details of individual scores can be found by clicking here. January: Snow falls heavily in the winter air, Animals hibernate – nocturnal with care, Farmers feed their animals – silage, cake and hay, To keep them healthy and strong through each dark day. February: On the farm, scanning has begun. Orange, blue and red sprays are used, So that singles, twins and triplets don’t get confused. March: In the calving shed, new life as we look, New-borns trying to stand and take their first sook, Sometimes they need help to find the milk teat, But when they do, frothy colostrum is a treat. April: The lambing shed is bursting out, When one’s lambing there is a shout, Driving around in the quad and trailer, It’s all about the sheep, not time to get out the baler. May: All the cows line up in front of the crush, Getting preened, clipped, then brush, brush, Goats, sheep, chickens and the rest, Of the animals which are best of the best. June: The sheep are gathered in, To be sheared and the wool not to be thrown in the bin, Tied in a ball and put in a bag, Sewed up with string and labelled with a tag. July: The chopper’s out running down the field, Tractors and trailers collecting the yield, Tea outside is something you can’t beat, Gammon, potatoes and ice cream – what a treat. August: Off to the market with the pickup and trailer, With Charolais, Herefords and Salers, To hand the animals over to the auctioneer, Hoping for the best value whether it’s a cow or a steer. September: Now you can see the Harvest moon, Barley, wheat and oats are coming soon, The combine needs oiling as it’s to work ‘till all jobs are done, Including baling and stacking under the sun. October: This is the month to sell, Prime lambs which have grown so well, Farmers, hopefully, smiling in delight, But only if their average price is right. November: By now the weather’s getting cold, All the lame tups must be sold, While the suitable rams have a busy month, Mating and hopefully making a lamb…or two! December: Oh goodness, winter’s here again, No doubt lots of wind, rain and rain, Twelve quick months – a busy year, The start of a New One is now here. Congratulations Seamus Halley of Balfron Primary who won our competition last year to design the front page of our 2019 Programme. We loved your picture​ so much we'll be running this competition again this year. All members of Strathendrick Agricultural Society are welcome to come along and enjoy an evening hearing the Chairman's Report, being taken through this year's annual accounts and selecting the agricultural section judges followed by tea, coffee and a small bite to eat. All members will receive paperwork for the AGM in the next week or so and within are forms to nominate judges. You can also PM us on FB if you are a member and your nominations will be put forward. If you haven't paid your membership but would like to come along you can pay on the night for 2018. Payments are also being taken for 2019's membership also. ​Thank you to everyone who helps make the show happen and to those that come along. ​We had an amazing show; the sun shone, the livestock was best in class, we had amazing trade stands and craft stalls, the best of our local school, nursery and SWI handicrafts and the most entertaining of entertainment including our band stage, helicopter rides, fun fair, pets tent and lots lots more. Thanks to all 53 local show committee members and associates for coming to our annual bowling competition on Friday night. Good fun as always before the busy show season starts and while Drymen didn't fair as well as last year with King Pin Sam McKechnie playing below par, we did still come home with the highest individual score from Jimmy Skea. However a massive Congratulations has to go to Braco who won the overall team prize for the highest combined score of all their players. See below for all the scores on the doors and here's wishing us all a great 2018 with lot's of sunshine on show days. DRYMEN SHOW DANCE, " DONNIE'S DOO". The committee would like to thank everyone who came along to Donnie's Doo on Saturday night and made it such an enjoyable evening dancing away to the fantastic Gunna Sound Ceilidh band, blethering and eating pies! At 7.30pm in Buchanan Arms Hotel, Drymen. All welcome. Drymen Show welcomes all to our annual Whist Drive being held this year on Sat 24th Feb in Drymen Village Hall at 7.30pm. Tea and Cakes are provided along with a well stocked raffle. 01360660668, Christine Crawford on 01360660659 or Susan Allan on 01360660868. Drymen Show is one of five in the local area, which also hosts Gargunnock, Stirling, Braco and Doune and Dunblane agricultural shows. This year's competition is at 7pm on Friday 16th February at Stirling. If you fancy coming along just contact one of the committee members from one of the shows as we'll see you there. To say thank you to all who support the show and in memory of our past Chairman Donald Beaton, we are holding a Dance in Killearn Village Hall on February 10th 2018 at 7.30pm. All are welcome with tickets at £10 available from committee members or by contacting Wendy Gillon on kechers@sky.com. It's a BYOB event with the fabulous ceilidh band Gunna Sound, a raffle, lucky ticket draw and light refreshments (tea/coffee and snacks) on offer. List of £5.00 winners in the attachment below. Thank you to everyone who submitted fantastic photographs into last year's competition. There were 2 classes - Show Time and Animal Magic- and we chose photos that reflect the future of Drymen Show and hopefully the next 200 years. We're therefore delighted to announce the following winners who will each receive family passes to this year's show on Sat 27th May. Thanks to all 60 committee members of our 5 local shows - Drymen, Doune & Dunblane, Gargunnock, Braco and Stirling - for coming along to our annual Bowling social. It was a great night to get together and kick start the show season, which we're all starting to plan for. Results are below, however we have to give a special mention to the oldest player last night Sam McKechnie (Toilet Convenor for Drymen Show) who despite his age and bandy legs managed to get the second highest individual score of the night, most improved prize ....he's normally last.....and help Drymen Show win the team trophy. I hope everyone had a good evening and wish you all a great round of shows this year. May the sun shine on us all. 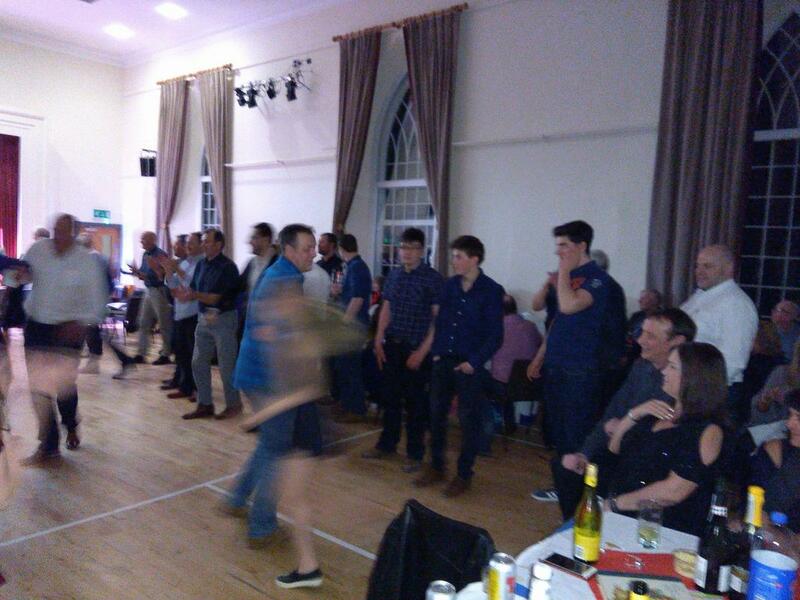 Thanks to all who came along on the night, and a huge thanks to all who brought Raffle Prizes and helped with the Teas. Thanks to everyone who came along to our Hoe-Down celebrations on Friday night. We really appreciate it especially as the day after was so busy for so many. Drymen Show has continued for 200 years because of the people who support it and with the show of support we had this year at the show itself and on Friday night (especially from our youngest generations) we have high hopes it will be running again for another 200!